When I wrote book reviews for my college newspaper or a (now defunct) online magazine, I always had to come up with a title for my review. I didn't do that here, as you can see. I think the title of this book is pretty catchy itself. 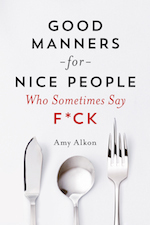 Good Manners for Nice People Who Sometimes Say F*ck by Amy Alkon: it got your attention, right? Or maybe you just like me and you're going to read what I wrote anyway, or maybe you're my husband and you feel like you have to read my blog. I know the title is what got my attention when it showed up in my recommended section on Amazon. I never say that word by the way. Though I might think it now and then. Does the name Amy Alkon sound familiar? I had never heard of her, but I learned from the book that she's an advice columnist and has a radio show. She has also authored two other books and has an active website where she calls herself The Advice Goddess. This is not an etiquette book, and I don't know if I would say it is a manners or advice book either. Unless the advice is on how to be rude back to rude people, or teaching the world a lesson. I like the idea of the book a lot better than I like the execution. Alkon tends to come off rude herself, and her acts of putting rude people in their place are kind of rude themselves like insulting their upbringing or the size of their man bits. Watch out, rude people Alkon is going to give you a talking to! Since most of the interactions where she feels the need to teach someone a lesson are with strangers it's unknown whether her tactics are actually effective for anything more than making her feel better. If it makes you feel better about some offense, why not then? I think that's the part I relate to the most. I want to teach people a lesson too and I probably come off rude myself when I actually do it. As, Alkon writes, "In economist-speak, I’m a 'costly punisher,' someone who gets outraged at injustice they perceive and is compelled to go after wrongdoers, very possibly incurring some serious personal costs in the process." That is totally me. For some reason, while I do feel a connection to the author, and see a lot of my own personality in her, I just don't like her. Maybe what I don't like about her are things I don't like about myself. I don't know, but she seems to be the opposite of "down to earth," and there's just a bit too much namedropping for my taste (even if I don't know who all the supposedly famous people she's talking about are). This review is more negative than I intended; I didn't hate the book. So now for the good. I would give it 3 out of 5 stars. It was definitely not what I expected from the title, and as I said, I didn't find the author to be very likeable. However, I did enjoy reading the book even if I would never take any of her advice. A lot of what she says about why we act the way we do makes sense, like how these days most people are strangers versus the close-knit communities of the past, so we don't worry about our reputations being injured when we let our dogs poop on the sidewalk and don't clean it up (that's something that commonly occurs in my neighborhood, not something from the book). I like to make a point as much as the next guy, but her method of leaving notes on the cars of people with bad parking habits will do little to change their behavior (they already don't care about what you think). Then again, she does give advice for ways to nicely point out someone's not so obvious offense, like when some guys in a parked car didn't know that their loud music could be heard inside her home, that could work. Alkon is telling us what we've probably heard before, that in those cases, it's much more effective to approach people with kindness instead of just yelling at them, which could likely cause them to turn it up even louder. Kindness is not my typical approach. I'm more likely to say nothing until I'm so annoyed that I explode. "...ten-plus years—about as long as it had been since I’d heard from him … until he contacted me to ask me to pay into his Kickstarter fund to finance the distribution of some indie film he’d made. My response: 'I would like to get a new pair of boots. Please send me $200 via PayPal.'" Husband can tell you how often I've said similar things during a rant about those Kickstarter and Go Fund Me "causes." As someone who constantly picks books based on the title or cover (yes, judging books by their covers), I've certainly done worse, but I do wish I had held out for a lower price on this one. Have you read any advice books lately?